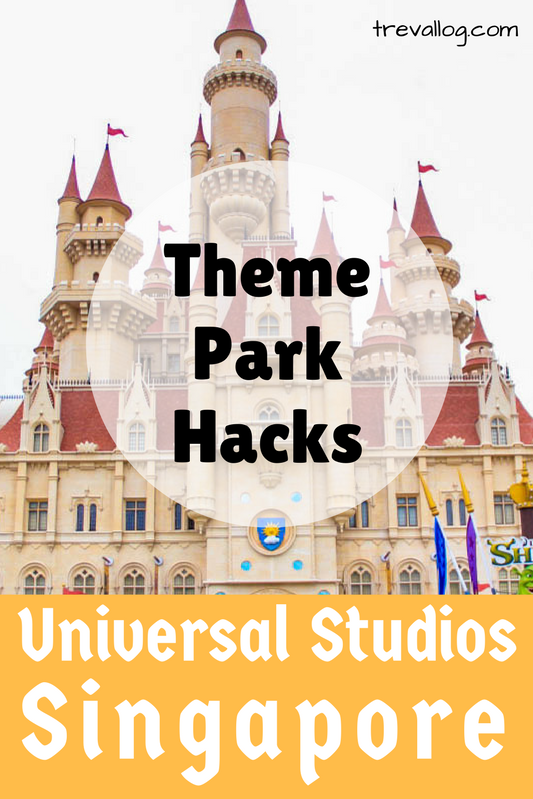 Have you ever visited Universal Studios Singapore? If yes, did you leave with disappointment because you didn’t have enough time to enjoy all the attractions? Do you ever wonder whether Express Pass is necessary at all? Do you want to know how to maximise your visit so that you can save money but still enjoy all of the attractions? In my first visit to USS, my friends and I were pretty occupied with taking photos and queuing for the rides & shows, we didn’t have time to enjoy all the attractions. Recently, my bf and I have purchased 6-months season pass so that we can truly explore the park during our leisure time. Over the 6 months period, we have taken our favorite rides for many times, we know when the best time is to visit the park, we know the shortcuts, and we know which rides are worth visiting. 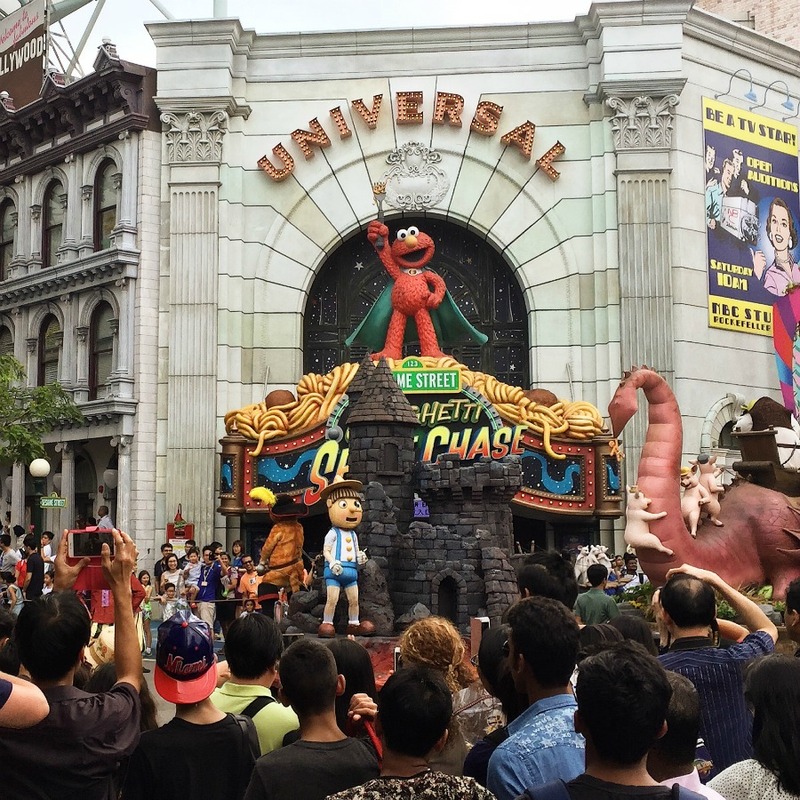 Based on my own personal experience, here is my Universal Studios Singapore Guide. One-day ticket for adult costs S$ 76, while a 6-month unlimited season pass for adult costs S$ 98. Therefore, if you have at least 2 days to visit USS, you should get a 6-month season pass. Since I’m staying in Singapore, I can visit USS any day I want, so I decided to get a season pass. I choose 6 months instead of 12 months because I feel that 6 months is more than enough for me to fully explore the park. Click here for latest pricing of memberships. Be there early in the morning, or late in the afternoon, when the crowd is not so big. I usually visit the park late in the afternoon, when basically most of the rides require 15 mins or less waiting time. The later you visit, the lesser the waiting time is. On most occasion, we spent only 5 mins waiting time for famous rides such as Mummy, Human, Transformer, Jurassic Park Rapids Adventure. The opening hour is 10am every day, but the closing hour varies depending on whether there are any special events. 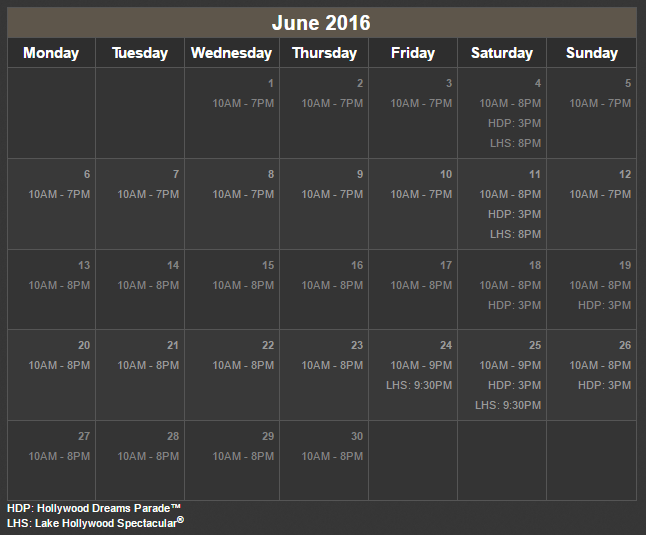 For the updated calendar, visit Visitor Info at USS Website. See calendar sample below. On some of the days, the park closes at 7pm, 8pm or 9pm. Notice that on 24 & 25 June, the park closes at 9pm followed by fireworks at 9.30pm; this means that the last entry for rides is at 9pm, after that you can hang around while waiting for fireworks. By the way, the parade and fireworks are amazing. This point is basically similar to point A3 above. If you can choose your visit day, choose the one with the extended opening hour and special events. For example, in June 2016 calendar above, the best day to visit USS is on 25 June. Do note that the opening hour is 10 am, so try your best to arrive at the gate at 9.30 am. There are 3 main ways to go to USS from Harbourfront MRT station with public transport, scroll below to point C3 for the full descriptions. Allow conservative estimation of 40 minutes for travelling from Harbourfront MRT to USS if you walk leisurely. However, if you are planning to take many photos along the way, allow at least 1 hour travel time. Everyone has different preferences for attractions. There are mainly 4 types of attractions: Rides, Shows, Street Performance, Characters Meet & Greet. If you decide in advance which one to prioritise, you can save time from thinking/discussing/deciding when you are in the park. Always take the ride with the shortest queue first. If the waiting time is more than 20-30 mins, do not waste your time queuing. Stay tuned for my next post on the full list of attractions and my personal recommendations. If you are a fan of shows / performances / meet & greet, and you don’t want to miss them, you should get the Schedule when you first arrive at the park. 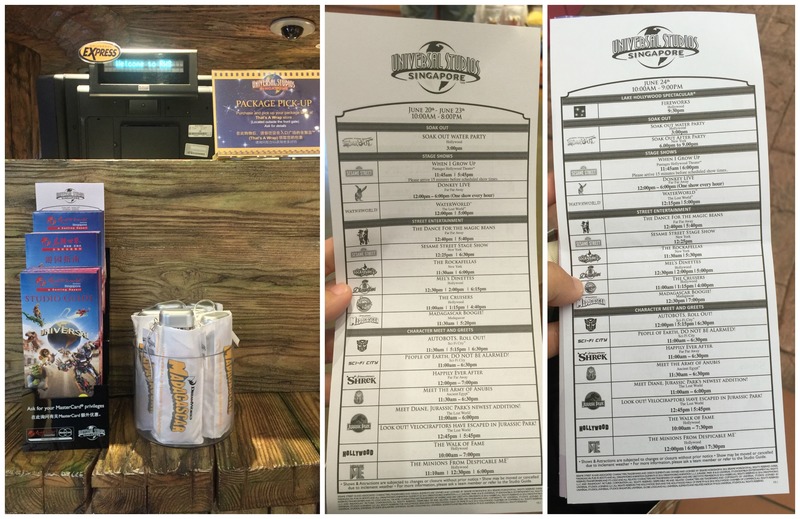 The Schedule can be obtained from any of the souvenir stores, near cashier counter. The schedule varies for different days. So you need to decide in advance what show to watch, then upon getting the schedule, you can decide how to fit all your favorite shows into 1 day. On the left, the cashier counter to obtain the Schedule. Center and right photo shows sample of Schedule. Here’s USS interactive map for you to play around prior to your visit. Basically, the park is divided into 7 sections. The entrance is Hollywood. If you go anti-clockwise, you will pass by New York, Sci-Fi, Ancient Egypt, The Lost World, Far Far Away, and Madagascar. Aaaand, yup, there are shortcuts! Just go to the lake in the middle, and walk along the edge of the lake, this way you can go to other sections of the park in a shorter period of time. In the map, the shortcut path is coloured in “white”. 1. How much is the ticket? Where to buy? You can buy the ticket from USS website or from the kiosks in front of USS gate, or from travel agents. One-day ticket costs SGD 79 for 1 adult. You might also wonder, is express pass necessary? Well, I don’t think so, unless you have extra cash laying around and you have very limited time to visit the park. Here’s a tip: You can purchase an open ticket of USS at the discounted price of SGD 72 (additional 5% if you use my code “trevallogsg“). The entry ticket doesn’t need to be printed, you can show them the electronic ticket. If you go during peak season such as Christmas, there are plenty of exciting shows, but there are huge crowds as well. Ideally, I recommend you to visit when there is special events, such as parade, fireworks, Christmas special, Easter special, etc. Check their Calendar as I’ve explained in point A3. 3. 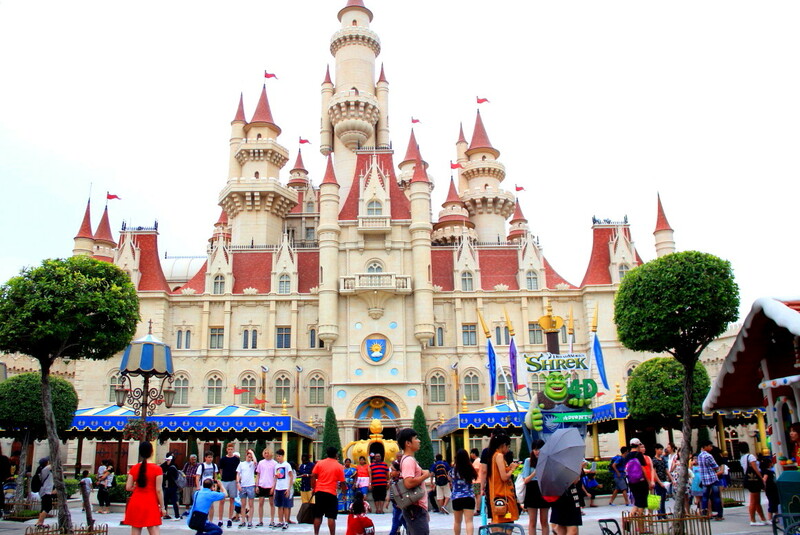 How to go to USS and go back? There are 3 main ways to go to USS from Harbourfront MRT station with public transport. Take Sentosa Express (it’s a monorail) for $4 from Vivo City Level 3, alight at Waterfront Station, and walk a short distance to USS gate. Take RWS8 bus from Vivo City bus stop (bus stop no 14141) for $2, alight at Resort World Sentosa, and walk to USS gate. 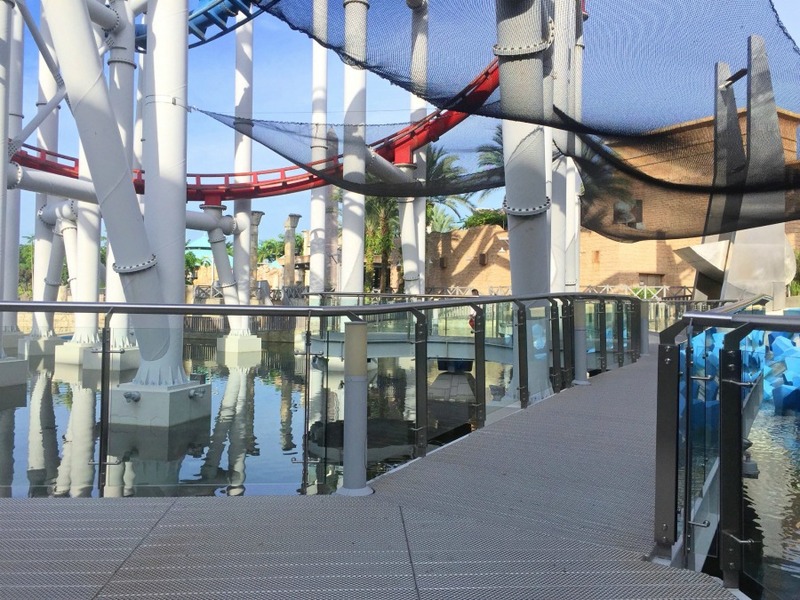 The cheapest but slowest option is to walk from Harbourfront MRT to Vivo City, take escalator/lift to Level 1, follow signage to Sentosa Boardwalk, walk along the boardwalk until you arrive at Sentosa gate, pay $1 entrance fee (currently there is free entrance until further notice), and follow signage to Universal Studios Singapore; the whole talking takes approx 40 mins if you walk leisurely. Once you are done with the park and ready to go back, you can choose either way from the 3 methods above, and you need not pay a single cents. My first recommendation is to take Sentosa Express monorail because it is the fastest way; however, if there is a long queue, you can take the bus from the basement bus stand near Casino; I don’t recommend walking back because it is time & energy consuming, unless you want to enjoy the scenery along boardwalk. Any kind of clothes are fine, but try to avoid thick clothes due to humid weather of Singapore. For footwear, my favourite is slippers. If you intend to play Jurassic Park Rapids Adventure, you will get wet, so try to avoid wearing shoes; and you can wear poncho if you don’t want to get wet, it is available for purchase in USS, but I think you’ll do fine without poncho. You should bring: empty water bottle (you can refill your bottle for free in the park), disposable poncho (if you don’t like to get wet when playing Rapids Adventure), camera/tripod/selfie-stick (for capturing the moments), and lastly a good mood! Also note that outside food is not allowed, so if you want to save money, eat your food at Vivo City Kopitiam or Seah Im Food Court prior to coming to USS. There are a total of 5 locker locations in USS: Hollywood near the park entrance, Sci-Fi near the entrance of Human, Ancient Egypt at the left & right entrance of Revenge of the Mummy, and The Lost World near Jurassic Park Rapids Adventure. However, 3 of them are free for certain period of storage (such as free for 45 mins or 60 mins, depending on ride waiting time), these three are: 1 at Sci-Fi and 2 at Ancient Egypt. So choose wisely. For more FAQs, you can visit USS FAQs page. Hi Mel, in my opinion, Monday would be less busy at USS, unless certain tour operators decided to bring their tour groups on that particular day. And since the park closes at 6pm on 3rd Oct 2016, I recommend you to arrive before 10am. Sorry for late reply, I had overlooked the notification. Hope you enjoy your visit to Singapore and USS. Cheers! Hey Ama, generally USS will be crowded during school holidays. You can check the exact dates of school holidays here: https://www.moe.gov.sg/education/school-terms-and-holidays In addition, avoid public holidays! 🙂 It’s best if you visit on a weekday! Hi Noha, my gut says that 26 Dec will be less crowded, because 26 Dec is not a public holiday, so most local visitors would not be visiting 🙂 As for the food, if you want to save time, you can eat the food inside USS! Honestly, we didn’t eat inside USS, so I can’t comment which restaurant is the nicest and cheapest. If you want to save money, the second option is to go out and eat at Resort World Sentosa’s Malaysia Food Street or walk to VivoCity (long walk) and eat at Kopitiam (Basement 2), but this option will cause you to lose so much time and energy. When you exit from USS, you can inform the staff that you’re coming back in again, so that your hand will be stamped.